There was a rumour that dour Finnish noise duo Pan Sonic used a custom-made white box of tricks that, if turned up to full power, was fully capable of demolishing a building. Whether apocryphal or not, that entertaining story neatly illustrates the intense and cauterising power of their work. Encountering Pan Sonic’s Mika Vainio in a sit down, polite venue like Cafe Oto therefore doesn’t come without its incongruities. Does this music not better suit being heard in a dark, anonymous, intense cavern? Not entirely. Vainio is at his best when he uses the space to his own advantage. A chaotic opening section seems designed to quiet his audience. Then, a simple, coaxing ‘phut phut’ pops from either speaker as a general snide hum begins to rise and fall. This itself falls prey to other more violent sounds, all cutting, buzzing and felt in the belly like a disembowelling band saw. But there’s a rhyme and a reason to why, throughout the venue, people are sensing structure and rhythm, finding their own narrative amidst the supposedly sparse and abstract. This is less noise than techno breaking to pieces, a melting circuit board. It’s telling that so much of the output of the Raster-Noton label, which brings art into the club space and vice versa, sounds inspired by, or shares a kinship with, the output of Pan Sonic and Vainio. It’s a sign of the muscular creativity of contemporary noisy techno-inspired musics that across Kingsland Road three nights later, Pete Swanson plays for Upset The Rhythm. This excellent promotions collective have, over the past decade, carved out a name for themselves as purveyors of skronky, cardigan-wearing underground noise and indie, helping the likes of Ariel Pink, John Maus and Dan Deacon into the fringes of the margins of the edges of the mainstream. After an awkward set of delayed glitch by Mark Fell, Pete Swanson—complete with baseball cap—is an explosion, a release. Somewhat brilliantly, he plays in the middle of the crowd, just as noise rock duo Lightning Bolt did when they played for Upset The Rhythm on their first trips to the UK a decade ago. It’s a simple trick but it works, breaking up the face-forward dynamic and, like flicking a spinning top into action, generates movement among the crowd. Much more than that though, the sound itself is gloriously dirty, confused, dusty, cracked and wanton. Imagine the careful, clean lines of the expensive polished granite worktops that Raster-Noton honchos surely have in their kitchens being set upon by Blixa Bargeld’s Kango hammer. If we take industrial-tinged techno as the framework—well, that’s the idealised vision of clean lines, a functional building, an efficient forge. Pete Swanson gives you all the rest—the roaring ventilation ducts, the sparks, the pile drivers, the beams of molten metal whipping across a foundry floor. It seems to revel in the tangible caustic gnarl and grind of the very stuff of which it is made. Increasingly, connections can be drawn between all sorts of musical forms that perhaps four or five years ago would have been hermetically sealed in their own private worlds. 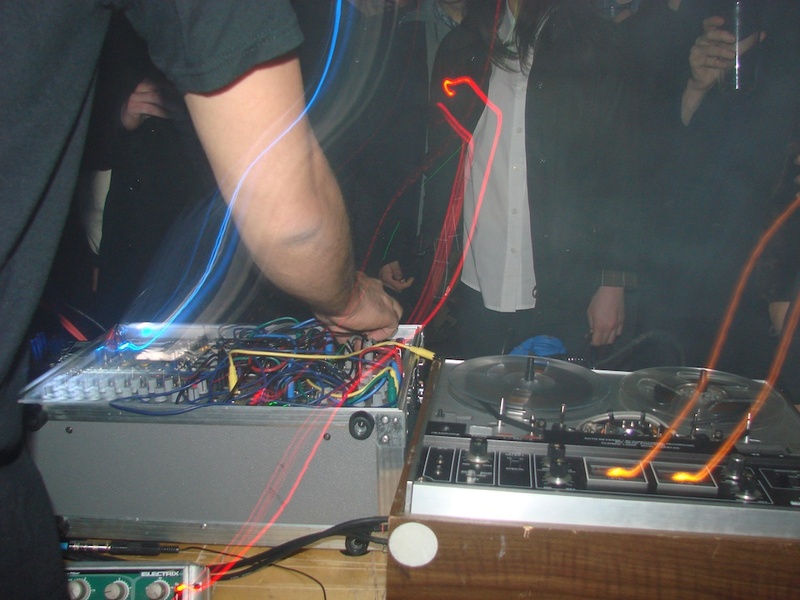 Techno’s increasing impact on noise, the thud of a jackhammer growing ever more audible amidst a cloud of grit, is something we’re going to be hearing much more of it seems. It’s (de)construction time again.